Coach Winky with Garfield Gators youth. 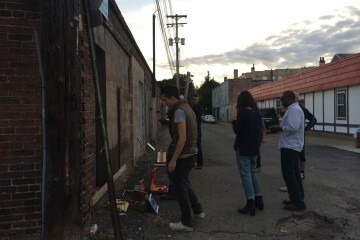 Brian Conway photo. On Saturdays, Garfield belongs to the Gators. For the past 23 summers, hundreds of fans, friends and family members have gathered at Fort Pitt Elementary to encourage and cheer boys 6 through 14 as they play midget football. 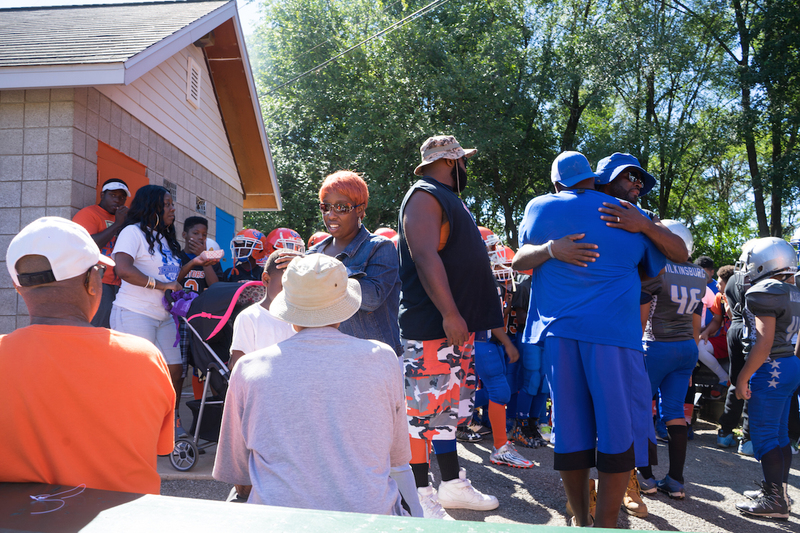 Last Saturday, August 27, the orange-and-blue clad Gator fans who arrived at the Swamp were greeted by tragedy: Coach Melvin Gay, age 45, died overnight of a heart attack. 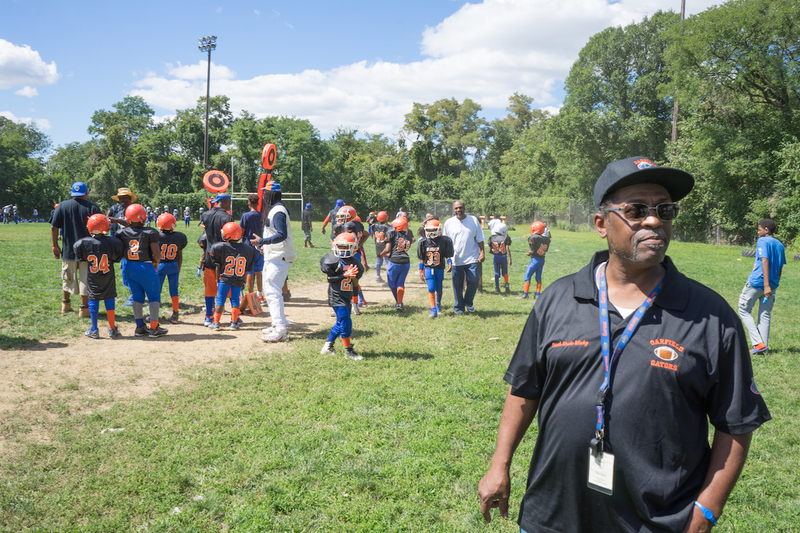 A retired firefighter, Coach Mel had been involved with the Gators for over 20 years; since 2009, he was head coach of the Twerps, the second youngest of the five Gators teams, ages 7 – 8. In Mel’s six years as head coach, the Twerps reached the championship five times, winning it all twice. “All the kids looked up to him,” says Veanna Cain, mother to DJ, age 9, a Twerp running back, as well as Deja, 8, a Gatorette cheerleader. Cain says Mel’s positive influence was the main reason she wanted her son on the team. ”Coach Mel kept him going,” she says. “When he’d get out of line, Coach Mel would put him back in line.” At work, when she heard of Mel’s passing, she broke down in tears. Garfield Gators. Brian Conway photo. 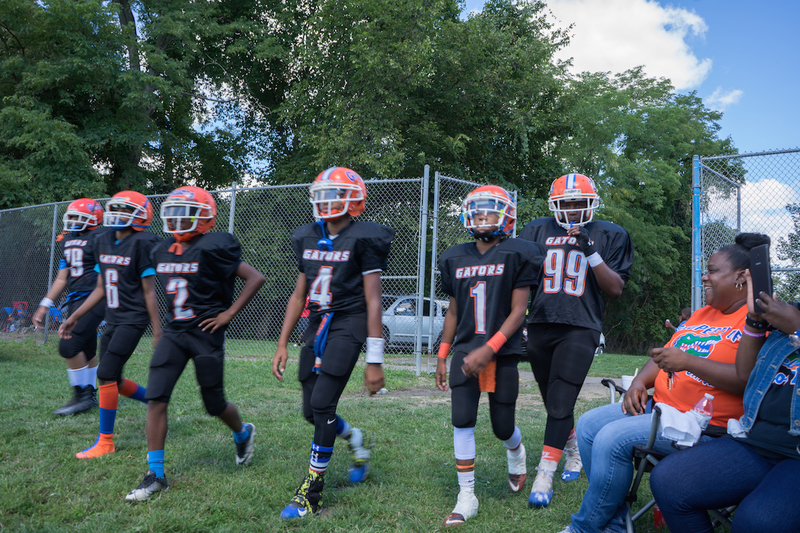 The Gators were formed in 1994 when four Garfield natives and close friends in their 20s, including Coach Jones, as a safe space to keep neighborhood boys off the streets and provide them with structure, discipline, and positive male role models—all things the founders lacked in their own life growing up. Over the years, the organization has expanded beyond football. Today, the Gators are housed under an umbrella group, Brothers And Sisters Emerging, which includes after-school programs and the Gator-way male mentoring to over 200 young Gators, from the Baby Twerps and Twerps up through the Termites, Mighty Mites, and Midgets, aka The Big Team. Coach Mel was always the first to arrive at the Swamp on Saturdays to check on the field and facilities, always quick with a smile and a laugh. On game days, children bounce between the swing sets and ice cream stand while the adults cookout and catch up with friends and neighbors between stints in the stands. The passage of time is marked by the referee’s whistle and the lengthening shadows on the field. Coach AP wears a shirt honoring Coach Mel. Brian Conway photo. On September 3, the day after the funeral, new Twerp head coaches, AP and Rock, wear matching airbrushed shirts bearing the likeness of their fallen coach. They say the mantra for the season has become “five teams, five championships.” It’s what Mel said the Gators organization should strive for this and every year; why settle for anything less? It certainly wouldn’t be out of the question. The Midgets won 69 straight games from 2008 to 2014. Like any good Pittsburgh sports team, championships are as expected by fans as much as they are celebrated. But the lessons imparted by the all-volunteer staff go far beyond the field. Over 90% of the Gators call Garfield home. Families pay $45 for a child to join the club, a slight amount that helps cover the cost of uniforms and equipment. Gators Director Bob Jones says that the team has no substantial financial reserves set aside and that funding must be established annually. 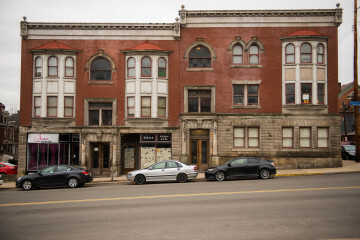 He hopes as Garfield develops, more money will be invested in community amenities such as rec centers, and that longstanding community groups like his—that have “done a lot with a little” over the years—are included in the conversation about Garfield’s future. “Investment is more than brick and mortar,” he says, surrounded by dozens of his young charges. Garfield and Wilkinsburg parents at the Swamp. Brian Conway photo. On September 3, the Gators took four of five against Wilkinsburg, including a dominant 28-0 victory by Mel’s Twerps. Before the game, the PA announcer asked the crowd to join in a moment of silence in memory of their fallen mentor. 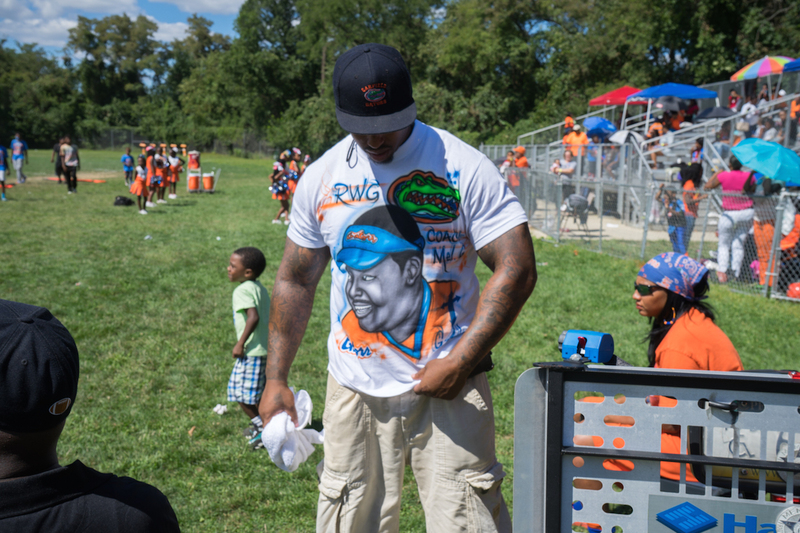 Catch the Gators September 9 during the Garfield Gators Tailgate and Alumni Charity Game, part of NEXT 3 Days Garfield.